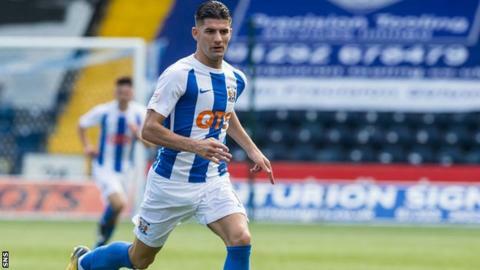 Kilmarnock midfielder Jordan Jones says his achievements in the last 18 months should inspire young players who are freed by their clubs. The 23-year-old has established himself in the Rugby Park first team and made his Northern Ireland debut after being released by Middlesbrough last year. "It's a good example for a lot of young lads who will go through what I went through," Jones told Kilmarnock TV. "The way I've turned things round is something to be proud of." Jones made only one first-team appearance for Middlesbrough - and spent spells on loan at Hartlepool United and Cambridge United - before being released. In June last year, he became one of 11 players to sign for Kilmarnock on the same day under manager Lee Clark and he is the only one of those players to still be at Rugby Park. On Sunday, he made his first international appearance, as a substitute, as Northern Ireland drew 0-0 with Switzerland and fell short of reaching the World Cup finals. "It's been an unbelievable 18 months and hopefully I can keep progressing," Jones said. "[Sunday was] not the result we wanted, obviously. We felt robbed after the two games because of one bad refereeing decision, but I'm delighted to have made my debut." Jones says that Kilmarnock's results and performances under Steve Clarke show the positive influence the new manager has had at the Scottish Premiership club. Clarke has also changed Jones' role, with the player switching from being a winger to having a less defined position. "It's a free role, so I have to be on the ball," Jones said. "I'll do anything I can to get on it. Then, when I get on the ball, I'm playing without fear and really expressing myself. I'm enjoying it."